Finally did my 1st triathlon on African soil. Which means African sun too. Luckily it was today and not yesterday. Drove through with my mom to buffelspoort on Saturday, too temperatures within the 33 degrees. It was hot! We arrived there to check in and to get an idea of the proceedings for race day the next day. This would be probably my only complaint to a well organized event and that is. Please have a frikken info sheet on the race. Routes, elevations, agenda, some rules and procedures. Anything that one can read before hand to understand what da hell is going to happen. If I was a newbie I would have been lost. Any how the rest was awesome. This morning it was overcast and temperatures where up to 26 degrees only. It was a wetsuit legal race, that I did without one. Mine is still packed in a container somewhere and I really missed. The swim was tuff. I was overtaken by quite a few swimmers. But my time in the end was surprisingly 30 min. I think (will explain later) that is down 6 min from zell am see. Also without a wetsuit. Which means the work I put in during winter paid off. Out of the water and on too the bike. Then my watch started tripping. My speed was all whacked. I am sure I did not hit 81km/h. I did not understand it and decided to ignore it and only ride on time. Also the multi-sport function was shait. Time to upgrade from Timex to the new Forerunner 910XT. On lap two I then realized the rookie mistake I did. I never ensured enough memory on the watch and did not delete the old sets. So then I had no timing except for the clock. So in the end I have no idea how i did and I been hitting the results page refresh a couple of times. Probably wait for tomorrow. The bike was tuff. One serious uphill that made you work the thighs and I even had to push it out of the saddle after running out of higher gears. It definitely was slower than zell am see. But I sat back and enjoyed the ride, especially the second lap I was able to gun it on the straights. Off the bike into a thorn and on to the run. Was only a little one. I am glad I still have hard African feet from walking barefoot until I was 12. Then run was great. I had slower than normal relaxed pace. No cramps in the muscles or stomach. I think my fueling for the entire event was spot on. Which is good to optimize for klagenfurt. It was a 3 x 7.5km lap. Was nice to see my mom all the time. Overall I think was a good idea to race. Dress rehearsal for klagenfurt, plus I need a boost in training and go longer and increase the intensity. I just hope I can balance it with the new job which has higher priority right now. But I know there is nothing like no time, there is only not making time. So it is possible. It was nice having my mom around, to show her how crazy I am. But I think she knew it when she supported me in the comrades route. I also did miss my normal support crew. Maggie, Alma, Tim and Yael. But I look forward seeing them in June. It was fun and I am excited for the next few weeks planning, adjusting my schedule and training. 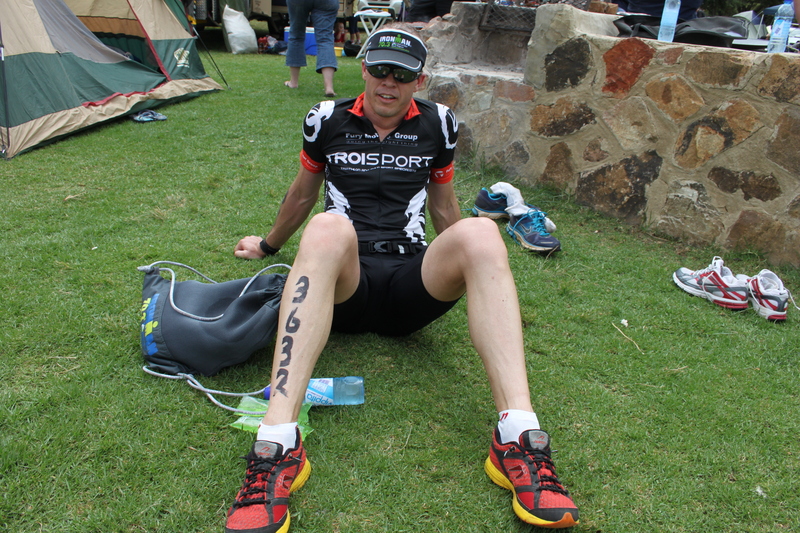 This entry was posted in Race, Tips and tagged race, triathlon. Bookmark the permalink.